Nornickel’s Polar Transportation Division (Dudinka) which transships the bulk of cargo to the Taimyr peninsula has completed the navigation season of 2018. In the 4-month period (between June and September), sea throughput totaled 445,484 tonnes, river throughput — 1.9 million tonnes. The result is comparable to that of the previous year’s navigation, says Nornickel. 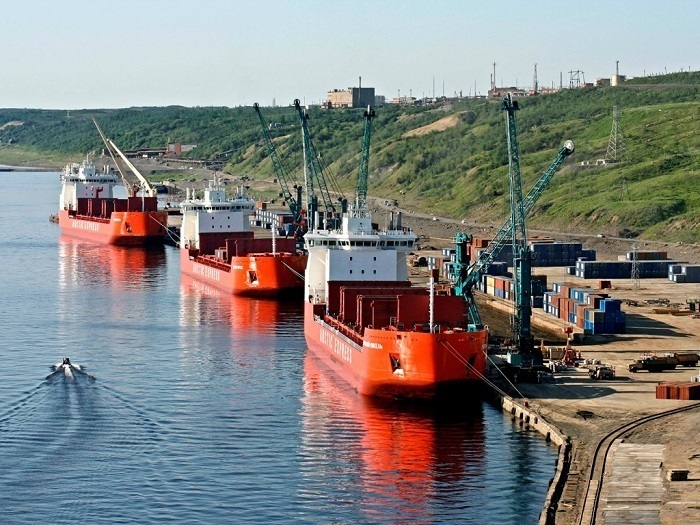 Throughout the summer season, the port of Dudinka welcomed 29 seagoing ships (with three foreign ships and other vessels representing the fleet of Nornickel) and 1,110 river going ships. In August, the port handled 3,427 tonnes per day. In the 9-month period, the port of Dudinka handled 3 million tonnes of cargo (+300,000 tonnes, year-on-year). The port accepted 2.2 million tonnes of cargo including 307,000 tonnes delivered by seagoing ships and 1.8 million tonnes - by river going ships. 183,000 tonnes of cargo was shipped from Dudinka by the Yenisei river and 673,000 tonnes – by the Northern Sea Route. The port of Dudinka is the world’s only port Far North with round-the-year navigation. The company’s fleet numbers six ice-class ships – five dry cargo carriers and one tanker, which is sufficient to ensure round-the-year shipping of materials. The port numbers 30 public berths including eight berth able to accommodate seagoing ships with draft of up to 10 meters. The port can handle oversize and overweight cargo (of over 200 tonnes).